You could be anywhere when your vehicle fails unexpectedly. Whether it’s a busy freeway or a quiet neighbourhood street, there’s a sense of vulnerability when you’re left stranded. Tow truck operators like Larry Styba regularly come to B.C. travellers’ rescue. That’s their job. But their job puts them in vulnerable positions, too. We recently talked to Larry about how travellers can protect themselves and tow truck operators in cone zones on B.C. Highways. TranBC: Hi Larry. Thanks for joining us. Please start by introducing yourself. Larry: My name is Larry Styba and I work with Maple Ridge Towing. I’m a WreckMaster Level 6/7, certified towing and recovery operator. I’m also our public relations person as well as driver trainer. TranBC: What can drivers do to travel safely near tow truck operators working roadside? Larry: The biggest thing about vehicles passing my roadside hookup scenes, or my cone zone, would be the speed that they enter my area. Many speeding cars do not slow down and give me little room to work. It gets pretty unnerving at times. Since 2009, the Government of BC established new regulations under the Motor Vehicle Act to protect emergency workers – that’s Slow Down Move Over. The simplest thing to do when you’re approaching a scene with a tow truck with its lights flashing is to slow down and move over to the other lane, if possible. If it’s not possible, the best thing to do to help us out on the roadside is to slow down to a 70 km/h speed in an 80 km/h or higher speed zone, or 40 km/h when in a zone marked 80 km/h and under. Passing me at those speeds would certainly give me a better chance to go home at the end of the day. TranBC: Do you notice distracted driving when you’re on the road. Larry: I think distracted driving plays part-in-parcel with speeding. If you’re entering my cone zone speeding, you must be distracted because you’re not following the law. I have seen people on telephones and doing many other things and that habit doesn’t go well for any of the general motoring public, let alone anyone in a cone zone. TranBC: Have you or anyone you have worked with ever had a close call as a tow truck operator? 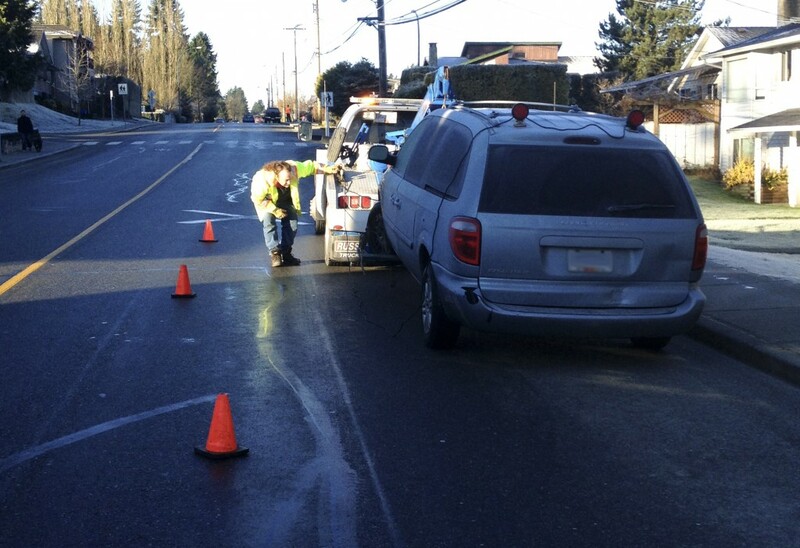 Larry: We were called one day to tow a car on the side of the Lougheed Highway, in an area of Maple Ridge where traffic goes from one lane to two lanes, and impatient drivers often open up full throttle and go blowing by anyone on the side of the road. At this particular time, we were called out by a family to come rescue their car. We arrived on the scene and activated our emergency lights. Our operator was wearing his personal protective gear and stepped out of his vehicle, placing his cones behind the vehicle to create his workspace. While watching all the traffic go whipping by him, the driver hooked up the roadside portion of the vehicle and quickly went around to the ditch side to hook up the other side. No more than 30 seconds had elapsed when a small light duty truck veered off and sideswiped the wrecker. The light duty truck veered across the highway and into a ditch. He was pinned and trapped himself, needing the jaws of life from fire rescue to get him out. Our driver was shaken up considerably, but not injured. Due to his training, he had placed the family well behind the vehicle and instructed them to keep watching traffic. The driver of the other vehicle had some minor injuries, which was really lucky, and so were we that we didn’t get killed. TranBC: How do you keep your customers safe while tending to their vehicles? Larry: What we’ve learned throughout the years is there is no safe place on the road. Each individual call has its own characteristics and its own environment. You never get the same call twice. What happens is you have to do a scene survey on every one of your calls. At that point in time, you almost have to suggest to the customer, “I think this would be a better place over here for you,” because they aren’t used to being on the roadside themselves. There really isn’t a safe place. We can only use some common sense to suggest where to be placed. We pull up on scene, activate our emergency lights, and what happens undoubtedly is the owner of the car always gets out of the vehicle to come and talk to the driver – even though he hasn’t stepped out of the tow truck yet because traffic is flying by and he can’t even open the door. So our customers, a lot of the time, put themselves in danger, which don’t realize they are doing. In situations like that, we would like to put the customer as quickly as possible into the cab of the tow truck. That will do twofold: one, it gives them better protection inside the truck from traffic, and two, we don’t have to worry about them so we can concentrate on the traffic coming up behind us while we and set up our cone zone and hook up the vehicle. TranBC: What does the Cone Zone BC awareness campaign mean to you and your fellow tow truck operators? If you have a Cone Zone story, we would love to hear it. Feel free to tell your story in the comment section below. Oh yes, using a smartphone while driving is still so common! It scares me every time when I pass a driver who is talking on the phone. Trying to avoid such ones ASAP, and yet still thinking what could potentially happen to the car next behind me that is now being endangered by that careless driver! Stay safe and keep others safe! Don’t drive sand talk!! Other than getting in a wreck, one of my biggest driving fears is getting stuck on the side of a freeway. I think it would be scary to be a tow truck operator, especially on really fast highways. That story about almost getting killed was pretty crazy, that’s why I’m always scared of being in a situation like that. This is some great information, and I appreciate your point that you should use common sense to stay safe on the roadside when waiting for a tow truck. I haven’t had to have my car towed before, but it will likely happen eventually, so it’s good to be prepared. I’ll definitely keep in mind to use my common sense and stay as safe as possible while waiting on the roadside. Thanks for the great post! Glad to hear you like it Kyle – cheers and safe travels! This is excellent advice, and I can relate to Natalie’s comment about not knowing what to do if a car breaks down. I had a tire blow when I was a teenager, and I couldn’t even get the jack out of its very secure holding place. A random, FREE highway service guy came to my aid. To this day, I’ve never seen another business like his, and I don’t know how he found me. Even that man couldn’t get the tire off my car, so he ended up towing me off the freeway. I’ll never forget that man who saved my day and expected nothing in return. That makes us happy Corinne – thanks for sharing! I think it’s great that customer safety is a concern when a tow truck arrives. I’ve definitely ridden with drivers who are overly eager to go talk to the tow truck operator, despite the hazards of the road around them. In the future I’ll urge them to be more careful, and even to wait for instructions on where to stand and things like that. Thanks for the helpful information! Tow truck drivers have a very dangerous job, so I am grateful for their willingness to help people in trouble. I got in a car accident a few weeks ago at 11 o’clock at night, and a kind tow truck driver was still willing to take my car. What’s the best way to get other cars to see you when you’re on the side of the road? Thanks for connecting with us here. Emergency flashers are a good way to keep yourself visible to others motorists. If you have them, setting up cones, or reflective warning signs will give other drivers better warning that you are pulled over to the side of the road. Hope that this helps! My car is very old, and probably on it’s way out; but I don’t have another form of transportation yet. It has recently occurred to me as I drive my senile car, that I do not know what to to if it were to break down. Thank you for such a helpful article, its good to know that the worker driving the tow truck has methods of keeping you safe while towing your car. Thanks for the kind feedback Natalie, safe travels. Nobody wants to get hit by a car while they are on the road. Tow truck drivers are no different. I’m sure that they are really scared of how fast the cars are traveling by them. Maybe I should start slowing down when I see them on the side of the road. If everyone thought like that Caleb, the road would be a much safer place for everyone! Thanks for connecting with us here.